When I started my epic re-read of Les Misérables, I was reading an old paperback and tweeting my commentary as I went, then using them as scaffolding for an article at the end of each week. The good thing about that was that I was posting things immediately, though on the downside I did have to condense things into 140 characters (sometimes less, since I was trying to link them together with a #ReadingLesMis hashtag), plus of course everything had to be posted, even if it wasn’t particularly interesting on its own. After a few weeks, reading in a place with no cell reception had me tapping out my notes offline instead of tweeting. This was actually a big improvement, since it meant I could jot down page numbers as reminders, or thoughts that would go well in an article but not in a tweet, and I could work on refining the article anytime I wanted. Starting with Part Four, “The Idyll in the Rue Plumet and the Epic of the Rue Saint-Denis,” I’ve been reading a digital edition of the same translation on the Kindle app on my Nexus 7. Instead of tweeting or jotting notes down in an email draft, I’ve been using Kindle’s built-in highlight and notes feature. It’s easier to carry around than the brick. I’m also reading a lot faster (when I have time to, anyway — ironically, I’ve had less time lately, so overall going is slower), because highlighting a sentence is much less of an interruption than setting the book down and tapping out a note on another device. And I don’t have to worry about worsening that tear in the spine, or the pages flipping back while I’m trying to read. On the other hand, it means I’ll be doing more work when I write up the articles, because I haven’t started composing my commentary yet — just a few notes and a lot of highlights of items I want to mention or quote. I’m 150 pages past the last commentary I published — the ambush in the slums — which is where I switched to reading on the tablet. The typos bug me, though. I haven’t seen this problem with other e-books, but this one? My best guess is this was scanned in and run through OCR. It’s the same text, format and typesetting as the Penguin Classics edition, down to the page numbers, but there are a lot of errors that aren’t in that print copy, and they’re all visual similarities, not keyboard misses or autocorrects. In particular, the word “die” has become “the” in at least three places (well, four, since one of them is twice in the same sentence!) in the hundred or so pages I’ve read since switching. And I do miss the at-a-glance indication of how far I am through a section. Flipping forward to see how many pages to the next break, then back, is a lot easier with paper than swiping your finger across a screen. Plus moving that bookmark is much more satisfying (and motivating) than watching the blue line at the bottom of the screen get longer. The worst part, though, of reading on the tablet? When time is short, it’s awfully tempting to use that time to catch up on emails or other busy-work instead of detoxing your brain with a book. That’s one case where a dedicated device or a physical book has the advantage. 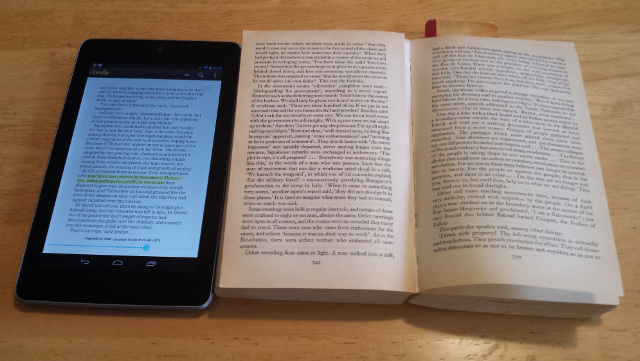 This entry was posted in About and tagged Kindle, Process, Usability on July 13, 2013 by Kelson Vibber.